In the same way as we previously asked, “Does KRION® scratch?”, today we ask “Does KRION® stain?”. The answer is similar to what we found in the video on Scratching. It does stain, like any other material, but we can regenerate it and leave it like new. 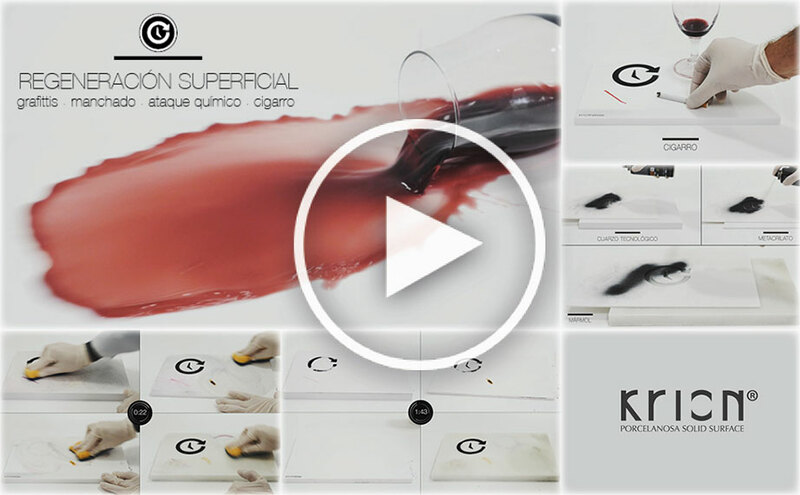 “Cleaning / Regeneration” (Graffiti, stains, chemical attacks, cigarettes)” The most important thing in this video is not just the cleaning; what is truly important is the possibility for regeneration that the material offers after unlikely perishable stains. The “Non-porous” property makes KRION® a difficult element to permanently stain, but certain substances left for several days may leave a mark on the material. Here is where our products differ from the other materials on the market. KRION® is difficult to stain or leave marked, but in the unlikely event that it occurs, we can regenerate the material easily, leaving it in its original state. KRION®, the solid surface from PORCELANOSA Group, is a safe choice for any application.